Grooming trends for men are an ever-evolving realm of personal hygiene and style. When it comes to maintaining a clean-shaven or sculpted look, your choice in razor is an incredibly important decision. Over the years things have evolved into multi-blade heads with cooling gel pad protection, then took a step back to redefine the safety razor. Out of all these new takes on the classic design, the Micro Touch endorsed by Rick Harrison of the hit TV show Pawn Stars is rapidly gaining popularity. There’s no denying that a traditional wet shave has its benefits. But, is this product really all it’s hyped up to be? If you’ve considered ditching your Mach 10 twenty-bladed razor complete with mint-infused face guards and free Wi-Fi for your grandfather’s classic shave, then this Micro Touch razor review contains everything you need to know. This product is the complete shaving kit package. Inside the box, you’ll find the Micro Touch itself, a chrome razor stand, 12 Dorco blades, and a carrying case complete with a mirror inside. The inside of the case is lined with a velvet-like material, adding to the classy appearance and classic style. The frame of this product is solid brass with a chrome plated finish. This gives it a nice weight in your hands. On the handle, you’ll notice the deep horizontal and vertical grooves used to provide a solid grip. Twisting the bottom of the product opens up the top to allow easy access for cleaning and replacing blades, which is a nice touch. Twisting it back closes the two butterfly doors, locking your blade inside. All in all, it’s your traditional safety razor. The idea is to use this just like you would any other razor. You’ll use the same motions and techniques you’re accustomed to. The only difference is that this is one blade instead of five or six. Regarding blades, Dorco is decent to start out with if this is your first time using a safety razor. If you find that you absolutely love a wet shave, it is highly recommended to purchase higher quality blades for your razor. The head itself allows for a minimal amount of the blade to be exposed, resulting in a fairly mild shave. Mild means that the blade does not apply a high-level of pressure on the skin. Thishelps to prevent razor burn and is often more comfortable for those with sensitive skin. The strength of the shave is non-adjustable. If you want this product to work exactly how Rick Harrison describes it, then there are a few steps you’ll have to take before and after each shave. Barbers utilize a very specific routine to treat the skin and give you that new man feeling. Start by prepping your face using a shaving cream lather, preferably with a bristle brush. Gently massage the warm mixture into your facial hair to open up the pores and make the hairs stand on edge. Think of it as a spa day for your chin. After you’re done cutting through your stubble, make sure to apply a calming lotion or balm to soothe the skin. This will help achieve that barbershop quality shave advertised. Once it’s all said and done, you’ll probably never want to return to a Mach or Schick again. DOES A SAFETY RAZOR BEAT OUT THE COMPETITION? Comparing one-bladed models to multi-bladed ones, the safety razor holds a distinct advantage. Multiple cuts across the skin can dig in too deep, causing ingrown hairs and an irritating, burning rash. A single blade grazes the skin at a gentler angle, providing a close cut without pulling on the hair. While cutting deeper into the skin provides a smooth finish, you can obtain that same feeling with the closeness of a single blade. You also won’t have to apply the same amount of pressure to achieve this effect. The blades on either type of model wear out just as fast. 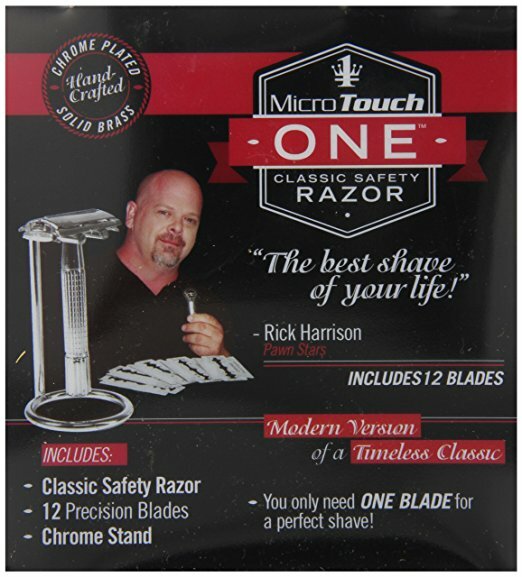 Any commercial that claims their multi-blade product can outlast a standard razor blade is flat out lying. The main benefit here is that it costs significantly less to replace the ones in a safety razor than the $20 Schick or Gillette packs. So, a better shaving experience for your skin at a fraction of the cost to replace blades makes for a compelling argument. Plus, you get to enjoy the classic barbershop experience in the comfort of your own home. While the twist open function makes changing your blades simple, the hinges used are metal and therefore are susceptible to corrosion over time. This could cause the feature to stop working altogether, making proper cleaning crucial to the longevity of your razor. The handle is only about 3.5 inches long. This gives it the ability to be taken nearly anywhere via the included case, but you might find it too short if you have larger hands. On the bright side, it does offer an excellent grip. The shave from this razor is mild, which is smoother and excellent for sensitive skin. However, anyone looking to tackle thicker beard growth might want to find a more aggressive option. With a sturdy build and mild shave, this product is an excellent choice for anyone looking to try a one-bladed razor. The grip will keep it from slipping out of your shaving cream lathered hands. The twist to open butterfly top keeps maintaining its quality simple. 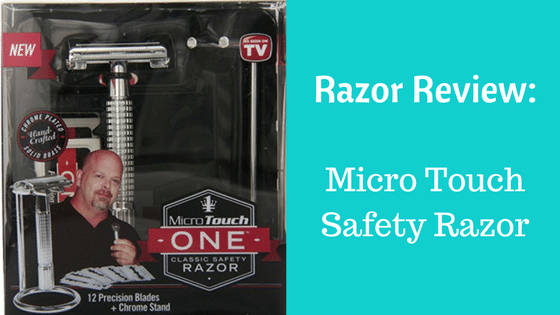 All in all, this Micro Touch razor review gives it a 4.5 out of 5 rating. Interested in trying it out?